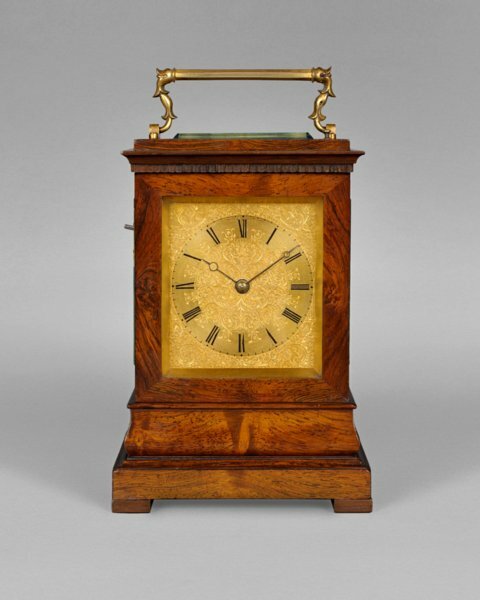 Anthony Woodburn deals in fine antique clocks - 17th & 18th century English antique bracket clocks, longcase clocks and antique barometers, including pieces by MCMASTER & SON, Dublin No. 3674. A rare mid nineteenth century travelling clock. The rosewood four glass case standing on block feet is surmounted by an octagonal gilt brass handle with foliate terminals and bevelled glass panel beneath. The three and half by four inch gilt brass dial is profusely engraved with scrolls around and within the polished plain chapter ring with Roman numerals. The blued steel pointers are in the style of Breguet. The dial is signed and numbered above 12 o’clock. The twin fusée movement includes a high quality lever platform escapement with cut and compensated bi-metallic balance. The hours and half hour are sounded on a gong with a soft / loud selection lever to the side. The hours can be repeated at will by a plunger on the top of the case. The back plate of the movement is signed and numbered by the maker. McMaster is recognised as one of Dublin’s finest clock makers working in the second and third quarters of the nineteenth century.